Making homemade ice cream, fruity sorbet or frozen yogurt for your family can be lots of fun during the hot summer months. If you don't have your instruction manual, here are instructions on how to use your Rival Ice Cream Maker to make cold and creamy ice cream and other frozen desserts at home. Prepare your favorite ice cream, sorbet, ice or frozen yogurt recipe or prepare one of the Rival pre-mixed ice cream products you can purchase at the Rival website. Chill the mixture in the refrigerator. Cool the canister of the ice cream maker in the refrigerator while the mixture is chilling. Any recipe can be made lower fat by changing the main ingredient—the milk or cream. Substitute 1 percent milk for whole milk, whole milk for half-and-half, and evaporated skim milk or half-and-half for cream. The more fat in the mixture, the smoother and creamier the texture. Lower-fat recipes result in a refreshing lighter dessert with a less creamy texture. After preparing and refrigerating the ice cream recipe, pour the chilled mixture into the cooled ice cream canister. Fill the ice cream canister 3/4 full. The mixture will expand during the churning process. Insert the dasher, making sure it is positioned correctly into the canister indentation. Place the cover on the ice cream canister. Place the filled canister in the bucket, making sure it is centered and engages with the bottom of the bucket. Place the motor driver over the ice cream canister cover so that the stem of the dasher engages with the hole in the bottom of the motor driver. Plug in the ice cream maker. While the unit is running, add 2 inches of crushed ice to the bottom of the bucket. Sprinkle about 1/4 cup rock salt over the crushed ice. Continue layering crushed ice and rock salt until the ice level reaches the top of the rotating ice cream canister. Wait about 20 to 40 minutes for the ice cream maker to stop churning. Remove the motor driver and then remove the canister. Carefully clean the lid of the canister to prevent salt or water from entering the canister. Lift out the dasher and scrape it clean with a spatula. Pack down the ice cream in the canister and replace the lid. Place the ice cream canister in the freezer for several hours to harden. Transfer the completed ice cream to smaller freezer containers or enjoy immediately. Add more crushed ice and rock salt as needed while the maker is churning. 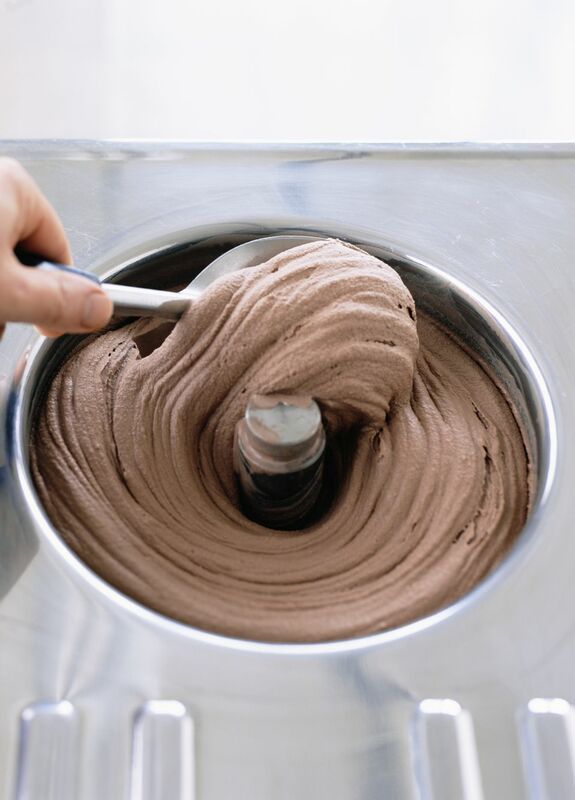 Ice cream will be soft at the end of the churning process. If you are away from a freezer, drain the salt water and add fresh crushed ice. Cover the unit with a kitchen towel to keep it cold. There is a drain hole on the side of the bucket that allows the salt water to drain out of the bucket. If it becomes blocked while the unit is running, clear the blockage. If the unit jams during operation, unplug it and twist the canister a few times. Plug the unit back in and continue making ice cream.